The field of hopefuls is growing for Maine's largely rural district, which could figure in the 2014 battle to dominate Congress. WASHINGTON – Rural Maine could become a front in the battle for Congress next year as Republicans look to capitalize on the first open-seat election in Maine’s more conservative 2nd District in more than a decade. Democratic leaders, meanwhile, are painting a less competitive picture of a district that, despite its rural nature, hasn’t sent a Republican to Washington in nearly 20 years. “No amount of political prognosticating can change the fact that Republicans in Congress are out of touch and obstructing job creation in Maine and throughout the country,” Rep. Steve Israel, D-N.Y., chairman of the Democratic Congressional Campaign Committee, said in a statement to the Maine Sunday Telegram on Friday. While the primaries are still 10 months away, congressional hopefuls are already starting to flesh out what is expected to be a crowded field of candidates. Five people have announced plans to seek their party’s nomination to replace Democratic U.S. Rep. Mike Michaud, who is forgoing a perceived easy re-election in 2014 to run for governor. 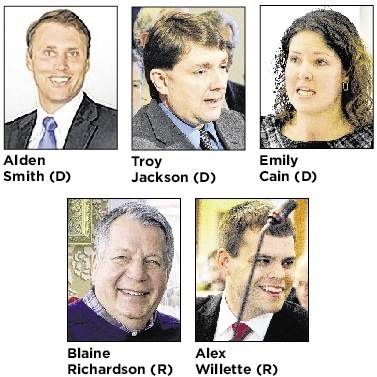 On the Republican side, 24-year-old state Rep. Alex Willette of Mapleton represents the infusion of young faces in Republican leadership ranks in recent years, while former Navy officer Blaine Richardson of Belfast is running for the second time on the party’s conservative flank. Across the aisle, Sen. Emily Cain of Orono is a 33-year-old former Democratic leader in the Maine House who is already raising significant sums of cash and attracting attention from national groups such as EMILY’s List, an organization that works to elect pro-choice Democratic women. Cain will vie against her colleague Sen. Troy Jackson, an Allagash logger and Senate leader likely to appeal to some of the same blue-collar northern Mainers who appreciated Michaud’s background as a paper mill worker. Political newcomer and former Navy submariner Alden Smith of Sangerville has also joined the race on the Democratic ticket. And then there is the lengthy list of those still mulling a run for Congress. Former Maine Senate President Kevin Raye of Perry and former Sen. Richard Rosen of Bucksport are seriously considering running on the Republican ticket. Both are moderate Republicans with lengthy political careers in Maine. And while Michaud soundly defeated Raye last year, many attribute the margin more to Michaud’s popularity than disapproval of Raye. Republican insiders say that Bruce Poliquin, a Republican gubernatorial and U.S. Senate candidate who served two years as state treasurer, is expected to declare his candidacy soon. A resident of Maine’s southern district, Poliquin has suggested he would likely move into the 2nd if he were to run. Attorney General Janet T. Mills, a Democrat, confirmed Friday that she is thinking about joining the fray, although she added in an email that “I do love my current job, a position I worked hard to achieve.” Two other Democrats — Secretary of State Matt Dunlap of Old Town and Rep. Jeff McCabe of Skowhegan — are also reportedly considering running. Bangor City Councilor Joe Baldacci, a Democrat, said he is still weighing whether to seek the congressional seat once held by his brother, former Gov. John Baldacci, whose 2002 gubernatorial bid opened the congressional door to Michaud. Former Republican House Minority Leader Josh Tardy of Newport is eyeing the race, although several party observers said they do not expect him to enter. State Sen. Garrett Mason of Lisbon Falls and Auburn Mayor Jonathan LaBonte — two Republicans in their late 20s and early 30s with political aspirations — are also reportedly considering congressional bids of their own. Tardy, Mason and LaBonte did not return calls seeking comment on their plans. While Democrats have held the seat for nearly two decades, Republicans controlled the district for all but 12 years between 1940 and 1994, when Baldacci won his first term. Potholm said whoever wins each primary should expect a call from their party’s national campaign headquarters the next day. And given the relatively inexpensive media market in Bangor and Presque Isle — especially when compared to metropolitan areas — Potholm expects the 2nd District to attract some of the flood of money by “outside groups” attempting to influence campaigns around the country. “TV stations in northern Maine are going to have a banner year,” Potholm said. Democrats, not surprisingly, believe Republicans are getting their hopes up. While Republicans have held the seat in the past, Democrats point out that both Baldacci and Michaud handily won re-election, sometimes with more than 70 percent of the vote. Additionally, President Obama safely won the district in both 2008 and 2012, despite Republican suggestions that the 2nd’s more conservative lean could favor their nominees. “For nearly two decades Maine voters have supported Democrats in Congress because they’ve been steadfastly committed to bringing new jobs to the region, breaking through gridlock and growing the local economy,” said Israel, chairman of the Democratic Congressional Campaign Committee. “I think Republicans have a better chance now that it is open, but I am still skeptical that it will be one of the Republicans’ better opportunities this year,” said Nathan Gonzales, deputy editor of The Rothenberg Political Report, an influential, nonpartisan newsletter in Washington that tracks congressional races. Gonzales joked that he felt “like we are caught in a time warp with this district” because many DC-based observers remember the Michaud-Raye match-up in 2002 — when Michaud won 52 percent to 48 percent after a hard-fought campaign — and expect a similarly competitive race this year. He suspects the dynamics have since changed but said it ultimately depends on who emerges from the primaries. “The quality of the nominee matters as the (National Republican Congressional Committee) and outside groups make their investments” in races, he said.